Hyundai Veloster (2012-2015) - Car Reliability Index | Reliability Index | How reliable is your car? 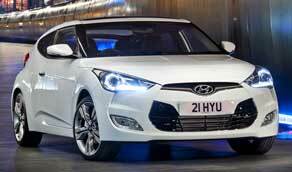 The Hyundai Veloster was one of those cars that was either going to be a surprise hit or it would sink without trace. Unfortunately for Hyundai, it turned out to be the latter. Potential buyers didn't really understand the Veloster with its weird door configuration; two on the passenger side but just one on the driver's side, but at least it offered hatchback practicality. The lack of any diesel option didn't help; the model range was very narrow with just a 1.6-litre petrol engine offered, in naturally aspirated or turbocharged forms. Around 2500 Velosters were sold in the first two years but things quickly slowed after that and the plug was pulled in 2015. Worth a look but nothing special, the Veloster is one of those rarities that owners seem to love but which the press couldn't warm to. 2/12 The Veloster goes on sale in the UK. At first only a normally aspirated 1.6-litre petrol engine is offered. 9/12 There's now a 1.6T engine available, the turbocharger making the car feel noticeably swifter while the more direct steering rack improves the handling. The Veloster Turbo SE also gets beefed up exterior styling plus a lot more standard kit compared to the entry-level car. There have been instances of the panoramic glass roof shattering, but nobody has worked out why this can happen. Some early cars with the dual-clutch transmission could suffer from jerky changes, but a software update smooths things out. The touch-screen display gets scratched very easily when trying to clean off fingerprints. Once it's damaged, replacement is the only true fix. The touch-screen display can also freeze up, stop responding or respond very slowly. Sometimes it can be reset but in some cases the only effective cure is a replacement. After heavy rain, if the tailgate is opened the water tends to channel onto the back seat, so look for evidence of water damage. While the build quality is generally pretty good, rattles from the door trims aren't unusual and they can also emanate from the dashboard.